In the digital age, there is no shortage of new technology to ogle over as we pass through stores, buyer catalogs, and YouTube videos. It seems like every day a new preview comes out featuring some sort of technology that seems like it has all the right tools to change the way we think about innovation in everyday life. And then it doesn’t. So, we move on, and so does the tech industry, furiously innovating as it pursues the magic formula for the latest and greatest life-changing apps, gadgets, and other products. But why does some technology seem to succeed while other tech products seem to barely make a ripple in the market? The answer comes down to simplicity. It’s complicated, of course, because simplicity seems like the antithesis to all things techy and innovative, but, in reality, it’s the name of the game when it comes to producing something that has the potential to become the new “thing.” Take the iPhone, for example. Since Apple produced the first iPhone, its design, its interface, its shape has only gotten simpler, more streamlined, and yet, equally innovative. In the eLearning world, it’s no different. We exist right now in a technology-based educational field that is begging for innovation but lacking in any sort of impulse for exactly how to innovate. The temptation for most eLearning bigwigs is to over-invest; to go out and grab all the newest tech and try to incorporate it into courses, programs, and trainings before any of the competitors do. People are eager to include things like virtual reality into online and distance learning, despite the fact that the market might not be ready for it. We’ll call this HTA (hyper technology addiction), and it’s a symptom of many of the modern elearning and tech companies alike. But, what many of us don’t consider is exactly how simple eLearning can, in many ways, be more effective in the long run than trying to push innovation all at once. It can not only end up being better for the customer, but, in a lot of ways, it can end up being better for the company providing the elearning. Below are a few points that outline just how effective simple elearning is in a world full of HTA. Everyone has had to deal with technical difficulties, and when it comes to elearning there is nothing worse than feeling unable to learn because something else is in the way. Whether it’s a difficulty finding a specific course or the inability to get through a course, keeping it simple allows customers to access learning without feeling overwhelmed or incapable. It fits the millennials bill without being overly complicated for non-digital natives. True, most millennials are natural techies, but anyone trying to make a splash in the eLearning field has to be able to cater to everyone. When it comes to elearning, no one, millennials or otherwise, is interested in an experience bogged down by technical difficulties or an interface that exceeds that of the iPhone in terms of usability. A clean display, simple, user-friendly interface, and high-grade visuals can transform a seemingly mundane elearning course into an enjoyable learning experience for all. It provides freedom for innovation without moving too fast. Contrary to popular belief, newer isn’t always better, and simple elearning can still provide an innovative experience without breaking the threshold of usability. 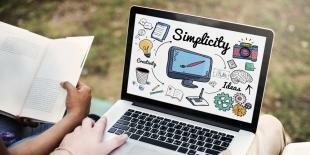 Even for millennials, there’s a point at which innovation exceeds simplicity, and though this might be appealing to the tech-oriented user, it is not a universally accessible way to present elearning to the average learner. Simple eLearning leaves room for advancement when the market is ready for it, and allows for companies and learners to find a natural progressive rhythm when it comes to innovation.